- Create Windows™ programs, 3D games and utilities. - Supports Windows 95,98,ME,NT,2000,XP and VISTA. - Run programs directly from the IDE. - DirectX™ Support with sprites, screens and scrolling maps. - Direct3D Support with lights, cameras, shapes and scenes. - Built-in editor, debugger and GUI/Dialog designer. - No external libraries or runtimes required. - Full MDI (Multiple Document Interface) support. - Dynamic window, dialog, and control creation. - Over 250 commands and functions built in! - Access to DLLs and the Windows API for unlimited extensibility. - Structured data types (UDTs) fully supported. - Console support and Console compiler. - Bitmap, JPEG, GIF, Cursor and Icon support is built in. - Random access file support. - Memory allocation and management functions. - Low and high level printer support. - Embedded browser windows for web-enabled applications. - Component creation and include support. - Rich edit, list view, status window and toolbar controls. 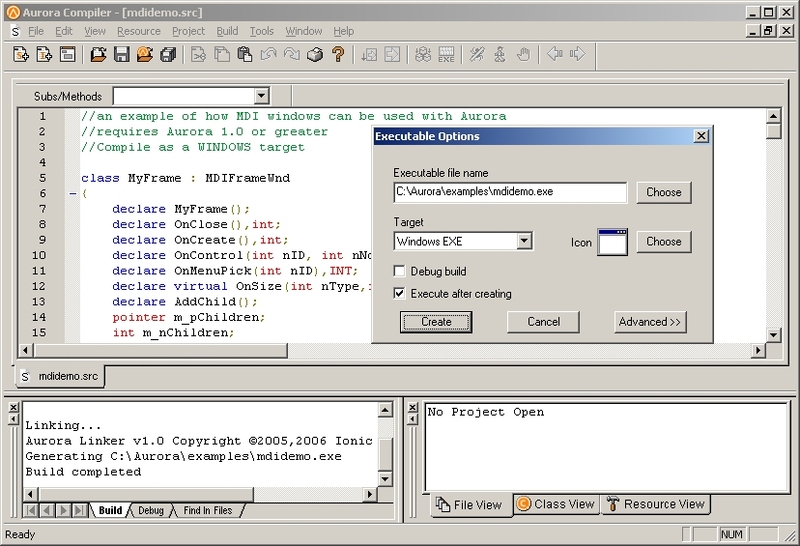 NOTE: As of 7/20/2010 the current version of Aurora is currently offered as Donationware. The download is a 15 day free trial. You can register the trial to unlock. A minimum donation of $10.00 is required to register Aurora. Future versions may have a different support structure.